The other day as I walked along a sandy beach, I noticed a series of footprints from a bird. Two things struck me. First, that even a small bird weighing just a few ounces left a clear footprint showing where it had been. Second, I saw that the trail was disturbed by human footprints. In fact, as I looked around, there were many, many more footprints on the beach from people than from any other critters. 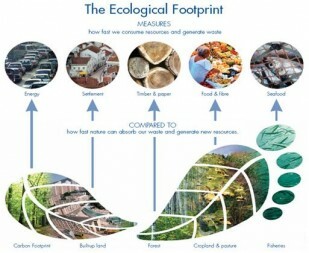 All of this reminded me of the “ecological footprint” that we all create. Photo courtesy of Global Footprint Network. Click to enlarge. The idea of an ecological footprint is basically a measure of how much area is needed to support our lifestyles, how much land is needed to produce all the things we consume, and what is needed to clean up our waste. 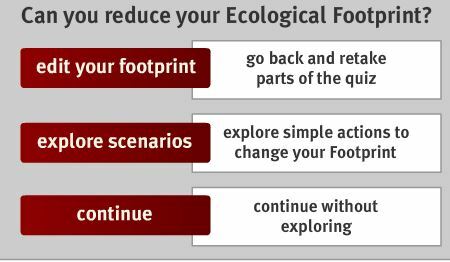 The concept became so compelling that governments, educational institutions, NGOs and corporations started creating ecological footprint calculators to explore their sustainability practices. In 2006, a set of standards was created by the Global Footprint Network to make sure that all calculators were consistent and realistic. These standards were revised in 2009 and again in 2012. As a consequence, there are dozens of calculators available on the Web. Most of these calculators require you to answer questions about how you get to work, what you eat, how you heat your home, what kind of home you live in, and more. 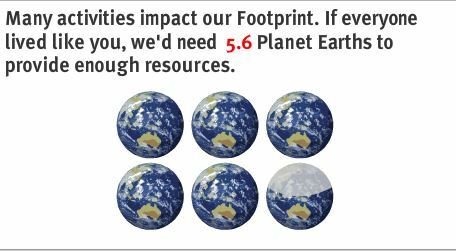 Based on this information, the calculator does some ecological accounting and quantifies the scope of your impact. 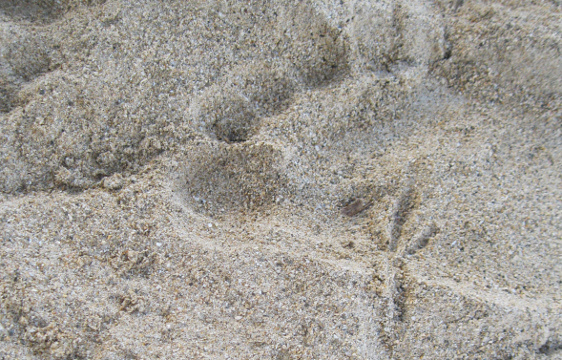 A sample result from one online footprint calculator. Photo courtesy of Global Footprint Network. For example, that bag of lettuce I used in my salad last night actually represents a chain of events that impacted the environment in ways that we often neglect to think about. First, a small piece of land was cultivated to grow the lettuce. It also took some gasoline to run the truck that brought the lettuce to me from California (where it was grown), so a small fraction of that truck’s energy use needs to be assigned to my salad. The gasoline used by the truck also put out 22 lbs. of carbon dioxide (CO2) for each gallon, so my footprint calculation should also account for the ecological costs of growing the plants that pull that extra CO2 out of the atmosphere. The upshot is that in order to accurately measure your ecological footprint, you need access to some extremely detailed information. If you want to accurately compute your own footprint, be sure to find a calculator that compensates for the place you live. Our ecological impacts are defined by our lifestyles as well as by our use of community resources such as transportation, electrical production, safety services, etc. For example, I seldom drive a car – I get around most of the time on my bicycle. And since I live in Washington State, I must account for the police and fire departments, school buses, and all sorts of other fossil fuel associated infrastructure needed to support me. If I lived in a remote village somewhere with no school buses, no fire department, etc., my footprint would be less in terms of these services. It might, though, be greater in terms of what it takes to transport my food to me. One of my graduate students in the early 2000’s had heard about the concept of an ecological footprint, and thought it meshed well with helping children understand that they are “linked to everything else.” So we decided to make a calculator designed for kids. Our calculator does not meet the standards set by the Global Footprint Network, partly because it was built before the standards were created. I’m not too worried, though, because our goal is to help children explore these concepts and connections. The calculator gives kids a chance to explore what might happen if they change just one behavior, and even tries to explain why. It shows how their footprints are linked with those of all the critters on the earth, beyond their overlapping tracks on a sandy beach. Clancy J Wolf. , ED.D., is Senior Faculty for Science & Technology Education, Islandwood. Clancy has worked with students, teachers, and researchers from Forks, Washington to Key West, Florida, exploring how technology helps students learn and challenging students to think about their role in the world around them. He is the past President of the Northwest Council for Computer Education, the country’s oldest organization for teachers who use technology in the classroom. Clancy holds a B.A. in Mathematics/Physics from Whitman College; and M.Ed. in Curriculum and Instruction, Secondary Education, Bowling Green State University; and an Ed.D. in Science Education, University of Michigan.